Tempesta dashed across the meadow. She stabbed the wet grass with long metal stakes as she ran, forming a network of upturned glass jars on iron poles. She ducked between the rusty trees of her makeshift forest with practised ease. Fat raindrops exploded in her black hair. "I'll kill him, I'll actually kill him this time," she muttered. She glared at the dark outline of the house among the trees. Tempesta swore she saw Tonitru silhouetted against an upstairs window. She hoped her younger brother saw her venomous look. Even if he escaped her wrath, he wouldn’t escape that of Father. A rumble of thunder rolled around the swollen purple sky. The ground vibrated beneath her feet, spurring on a fresh burst of speed. Tempesta put the trees and the house behind her, racing out across open grass. Lightning lit the undersides of the bruised thunderheads. "No no no! Not yet! I'm not ready!" Tempesta shouted at the sky. She rammed the final stake home as jagged claws of lightning tore open the clouds. Tempesta threw herself away from the metal pole as the electricity struck. The glass glowed green as the lightning snaked between the iron stakes. The jars hissed and spat as the raw energy made contact. Tempesta allowed herself a smile; the lightning coiled in the glass urns, humming a low note from the Song of Storms. The thunder coughed and spluttered overhead, the clouds rippling and breaking apart. Tempesta sat back on the grass to watch the growing patches of blue sky. She thought of the broken storm casket, lying at Tonitru's feet. His penitent and fearful face swam before her eyes. She thumped the grass with a tired fist. The storm averted, Tonitru may have escaped their Father’s wrath, but Tempesta vowed that she would never allow her little brother to play in her room again. Lyrical and potent! I felt like there was an entire mythology behind these characters. I wouldn't want to be on Tempesta's bad side, though Tonitru got off easy this time. As a guy with three older sisters, I can assure you that Tempesta will not be rid of Tonitru easily. Heheh loved the ending! I agree you built an intriguing mythology in such a short space. Tony - There is a mythology behind them in my head but I doubt I'll be delving into it any time soon! Tim - I'm only a younger sister but I was always glad I never had a younger brother! Stacey - Glad you liked it! I really enjoyed this, Icy! Great start to something and I would love to read more. It had the feeling of this epic fantasy you could really build on. Then you really threw me at the end and had me laughing. Pretty dangerous place in a thunderstorm if the forest can rust! The setting was the most interesting bit to me; how it was created and what it actually looked like. I dug the denizens, too. I'd certainly want to stay on tempest's good side. I loved this line "Fat raindrops exploded in her black hair." Tempesta is… tempestuous, no? (Yes, I had to go there.) Awesome world-building sketch here — I hope you find time to come back to this world. This reminds me of the time my own little brother knocked my 10-gallon fish tank over. Guppies everywhere. I wanted to KILL him! Love the idea of a Song of Storms. In so few words you build a strong character in Tempesta. 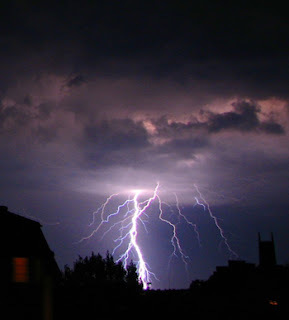 Incidentally, whilst in Greece I experienced the most sustained lightening storm I thought possible. Hour after hour of brightly lit night skies. Has Tempesta taken a holiday recently? I liked this, especially the sense that this was a glimpse into a rich world. Sure you don't want to write more here soon? Fabulous visuals. I loved the fat raindrops exploding in her hair. Like Tony, I felt that there was a whole history here. Tempesta and the storm are indeed well-suited. Brothers can be a pain! I feel her pain. And the world you sketch out is fascinating! Gorgeous, love stories about storms and lightning. You pulled this off beautifully. As Tony already noted, my thought while reading was that this was a nice piece of mythology. I liked how she worked with the jars to capture the lightning and abate the storm. Good work, Icy. Delicious descriptions the whole way through. I was there in the moment, caught up in her intensity. A clever idea well executed, Icy. I so enjoyed it. I would not mess with her room. Fun read. The beauty of this short piece is the unspoken background of the characters, but it speaks so well through the story. Sibling rivalry and tensions are universal.